Last week’s article, “Politics takes a back seat,” certainly raises serious questions about Supervisor Dougherty’s budgeting process for 2016. School, police and Civil Service Employee Association contract negotiations are quietly underway but the affected employees are working without contracts because they’ve all expired. Talks at the school to renew contracts with teachers and other staff members are underway, according to Superintendent Michael Hynes. The teacher contract expired in June. Contracts for SRP (school-related professionals) and custodial workers contracts haven’t been in place since June 30, 2010. “That’s a long time,” Dr. Hynes said. Workers’ morale is affected when people are without a contract, he said. He’s hoping the contracts can be resolved without more long delays. “The fact that we’re talking, I’m optimistic,” he said. Dr. Hynes said district negotiators are “looking at something that is meaningful. We are negotiating something that is fair and balanced,” he said. SRP covers school-related professionals, including teachers’ aides, clerical staff and food service workers. While the contract for custodial workers is separate, it parallels the SRP agreements and is traditionally negotiated at the same time. Police and town officials ended up with an arbitrated settlement last year that did not go beyond 2011. It provided for a 3-percent increase retroactive through 2009. Although both town and police officials expressed support for the arbitrated settlement, no one wants to go that route again. “We were sorry it couldn’t be resolved without going to arbitration, but that didn’t happen,” said Officer Dave McGayhey, head of the PBA, at the time the settlement was announced in August. “The PBA is just hoping that we don’t have to go this route again in 2012 and we can resolve our contract without arbitration,” he said. The town’s contract with the CSEA, covering 10 clerical and inspection workers, expired December 31, 2011. It was a three-year contract settled in April 2010 that was retroactive to 2008. CSEA members include clerks in the Justice Court, Police, Highway and Building departments and the Assessor’s office, as well custodians and building inspectors and personnel who serve on various boards and committees. Beverly Pelletier, the Justice Court clerk, is the CSEA negotiator. She said talks with the town haven’t yet begun and declined further comment. 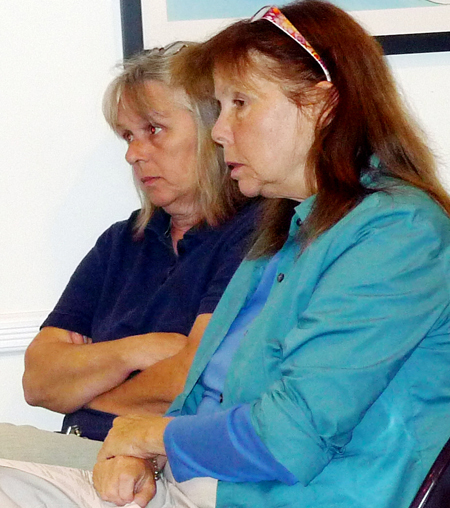 PETER BOODY PHOTO | Justice Court Clerk Beverly Pelletier and Justice Helen Rosenblum at a recent Town Board work session. Co-workers who wanted to give their own sick days to town employee Teresa Montant will now be able to do so. The Town Board on Thursday, October 6 convened a special meeting and voted to allow town workers to transfer sick days to her under the terms of an agreement between the town, Ms. Montant, the Civil Service Employees Association (CSEA). the Highway Benevolent Association and the Shelter Island Police Benevolent Association. The Highway Department and public works secretary, Ms. Montant has been fighting breast cancer and is a leader in local breast-cancer awareness campaigns. At the same meeting, the board hired Cara Cass as a part-time clerical assistant until the end of the year to help Justice Court Clerk Beverly Pelletier with what she and Town Justice Helen Rosenblum called a “crushing workload” at last week’s Town Board work session. Ms. Cass will be paid $4,200 at a rate of $16.50 an hour for 20 hours. The funds are available in the court’s budget, according to Ms. Pelletier and Justice Rosenblum. Justice Rosenblum told the board that Ms. Pelletier was meticulous, hard working, and never complained, and if she said she needed help, the board should consider it a valid request.